The 80,000 were coolies employed in the depots which lined the main roads, in areas cut out of the jungle. They could obviously not fight themselves, and would get in the way of anyone else who tried to. Some civilian labour had disappeared altogether. On the 2nd April an officer and his batman, just arrived with 5th Brigade, rode their motorbike into a large canteen issue depot. Walking up to the counter, they found themselves gazing at vast quantities of chocolate, food, toilet requisites, cigarettes, beer, and even whisky. There was not a soul to be seen and their shouts to be served failed to bring anyone. The whole stock was at their disposal. Debating for a moment what might be the most useful stores to take to war, they decided on chocolate, cigarettes, tinned pineapple, and a bottle of whisky, which were all stowed into the saddle bags. The officer then wrote his name and unit on the counter and offered to pay if a bill were sent him. Needless to say, it never was. But the chaos wasn’t only caused by the coolies and civilian labour. Large numbers of officers and troops who were on their way back to Imphal from leave when the road was cut were hanging around idly in the Rest Camps. Some of them, under the Area Staff, were formed into defensive companies and others were sent out on patrols. But they were very depressed and hated the whole business; if they were going to fight the Japs, they wanted to do so with their own units. But time, like tarpaulins and a good many other stores, was in short supply, both at Dimapur and Kohima. On the afternoon of the 31st March, Richards watched the Royal West Kents get in their trucks and move down the road for Nichugard. All he could do now was shorten his line, set his men at work digging for dear life, and stock up the forward posts with food, water, and ammunition. The evacuation of non-fighting personnel was still going on—and would do till the road was cut—but it was under control of 253 Sub-Area, and Richards was neither advised nor consulted. How many men would be left to fight and how many still to be fed, he’d still no idea. His allocation of troops at this moment was as follows: G.P.T. (General Purposes Transport) Ridge, to the south, a composite company of Indian troops, with some V Force men, a company of Gurkha troops, and a few rear details of the Assam Regiment. A roadblock to the south of this position was manned by some Gurkhas under a British officer. On Jail Hill, there was a rifle company of the 5th Burma Regiment and a Garrison company of the same regiment. On D.I.S. and F.S.D., two platoons of Mahrattas, some V Force troops, a composite company of Indian infantry, some R.I.A.S.C. men, and a G.P.T. company under a regular Indian Army officer, Major Rawlley. Kuki Piquet, one of the hillocks on the ridge, between Garrison Hill and F.S.D., was held solely by some V Force men. The D.C.’s bungalow was held by a party of British troops, while the I.G.H. Spur was held by the Assam Rifles, commanded by Lieut.-Colonel Keene. On Summerhouse Hill there were some State troops, who also maintained a detachment on Naga Village, the high ground to the north. Five regimental aid posts were set up for the various sectors, and telephone lines were run out to the unit command posts round the perimeter. In the time available, Richards also made his supply arrangements as comprehensive as possible. Fifteen days’ rations were distributed, of which seven were the ordinary rations and the remainder were ‘hard’. Two-inch and three-inch mortar ammunition was carried to the perimeter posts, together with smoke grenades, Mills bombs, and Verey light cartridges. As long as the men were alive, they would have something to fight with. But water was a different matter. In the D.C.’s bungalow compound there was a large metal tank, filled by a pipe running from the Aradura Spur via G.P.T. Ridge. This pipe would obviously be cut very early in the battle. To help matters, the engineers had dug in two tarpaulin tanks, and there were six steel tanks at points between the bungalow and the F.S.D. How long these would remain unholed, once things got started, was very doubtful; and water would obviously be one of the main problems. The only hope, if things got really bad, was supply from the air. Even more important than water was morale; fortunately the departure of the Royal West Kents had left this unimpaired, many of the troops being unaware of what had happened. Some time during the 1st April, Richards received an operation order from Ranking which informed him that the garrison would be reinforced by the Assam Regiment ‘if extracted from Jessami’. But, being an experienced soldier, Richards contained any optimism in this respect; he knew that the battalion must have been severely mauled, even if it escaped intact. The order continued: ‘You will command the garrison of Kohima, and will deny Kohima to the enemy as long as possible without being destroyed yourselves…. 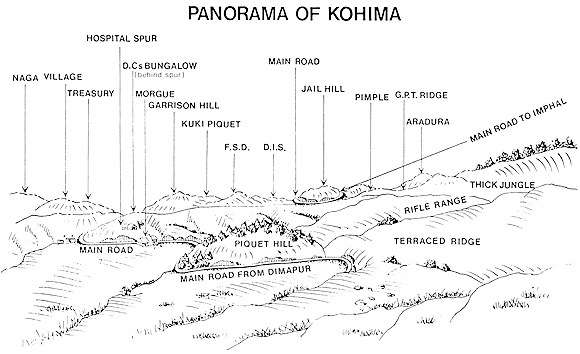 The decision as to the precise moment when it will be necessary to withdraw from Kohima must be made by you.’ This sentence revealed that Ranking wasn’t subject to any false optimism either, and was obviously expecting the whole ridge to be taken. At the tail end of the document came detailed orders concerning the destruction of supplies, vehicles, secret documents, ciphers, and signal equipment. Richards was told to take action so that this could be carried out immediately, but refused. As he says: ‘Nothing could be more unfortunate or undesirable than that there should get abroad any idea of the possibility of a withdrawal from Kohima, however remote. I therefore put the order in my pocket and neither showed it or mentioned it to anyone except Colonel Borrowman, my second-in-command.’ One can’t help remarking that Richards was wise in this decision, as in another. He had been told to ask Pawsey to inform the Nagas that if the British withdrew from Kohima, it was still their intention ‘to return and destroy all the Japanese west of the Chindwin’. He decided that any premature announcement would be very dangerous indeed, and left the matter to be decided on the outcome of events. On the 2nd April 33rd Corps headquarters opened at Jorhat and General Stopford assumed command of all troops in the Assam and Surma valleys. The tasks given him by Slim were: to prevent enemy penetration into those areas, to keep open the line of communications between Dimapur and Kohima, and to be prepared to move to the assistance of 4th Corps and help in all possible ways to destroy the Japanese forces west of the Chindwin. The speed with which these tasks could be accomplished depended very much on the speed with which his troops could be concentrated. Stopford’s estimation was that by mid-April he would have the whole 2nd Division, 161st Brigade, 33rd Brigade (from 7th Indian Division), the Lushai Brigade, a regiment of armoured cars, a squadron of light tanks, and possibly a squadron of medium tanks. But the next ten days or so, while these units trundled over the ramshackle railway system of north-eastern India, were going to be anxious ones. 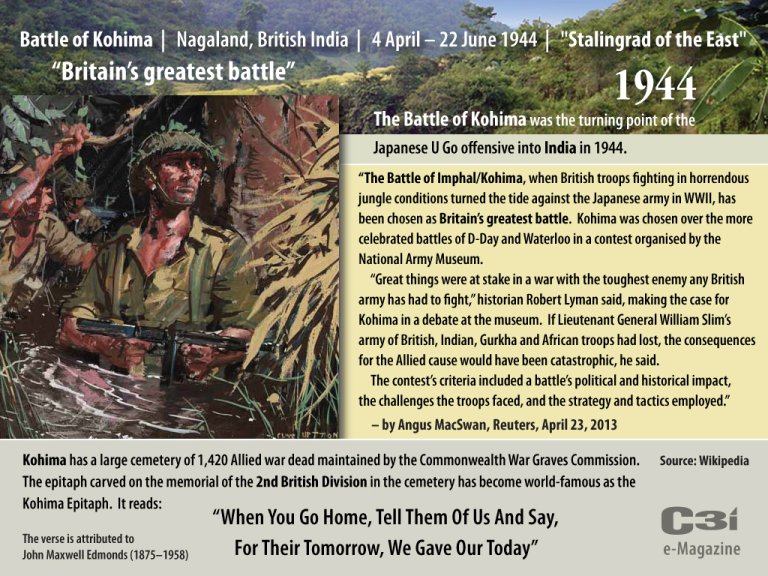 As to the enemy, Stopford’s information was that two regiments only were moving on Kohima, the 124th Regiment (which was moving at the rear of the Main Column) having been ‘lost’ by the Intelligence. What he was afraid of was that the lost regiment would move via Layshi into the Assam Valley, with Gologhat and Mariani as its objectives. Meanwhile, another problem was raising its head. The 2nd Division was heavily mechanized and unequipped for fighting in mountainous country. Unless it were to be tied to the road during its advance towards Imphal, which would make tactical movement impossible, it would have to be found mule transport and instructed in its use. An urgent signal, therefore went to 14th Army for mule companies, though whether they could be spared seemed very doubtful. Mountbatten, however, had good news this day. A signal from the Chiefs of Staff informed him that from Britain and the Mediterranean he would soon be receiving a total of ninety-nine transport aircraft. These would enable him to supply 4th Corps in Imphal by air, as planned—though not indefinitely. The signal added that seventy-nine of the aircraft must go back by the middle of May, as they were required for an operation in Italy. In the afternoon of the 3rd April, there was a conference at Jorhat attended by Mountbatten, Slim, Stopford, and other commanders. Slim outlined the situation at Dimapur and Kohima, and said the latter must be held if possible, ‘since it would be hard to recapture, and its loss would undermine Naga loyalty’. He added that he had told Stopford to reinforce the garrison, ‘as soon as he could do so without endangering the safety of Dimapur’. Exactly when that moment would come, it was still impossible to say. While the higher command was meeting at Jorhat, ‘Bruno’ Brown and a party of survivors from Jessami were climbing up the slope of Garrison Hill at Kohima, to report to Richards’ headquarters. They were tired and foot-sore, but each man carried his weapon and was determined to fight on. The urgency of the situation precluded any courtesies, or any rest, and before long the troops were at their allotted sectors on the perimeter and hard at work improving them. Before dark, other small groups of men came streaming in, both from Jessami and Kharasom, some with officers and some without. Fortunately the Assam Rifles’ Quartermaster was on hand to replace torn or blood-matted clothing and issue items of personal kit. He also saw to it that the men were fed. By the time the last stragglers had reported, 260 officers and men of the Regiment were available to help in the fight, some indication of the spirit of this young battalion. Some time in the afternoon the Nagas brought in news of an enemy concentration at Mao Songsang, twenty miles to the south on the Imphal road. (This was part of Miyazaki’s column, which was now preparing to move north.) In the evening, Richards sent out a fighting patrol, under Major Giles, with orders to get up into the high jungle on the Aradura Spur and harass the enemy. To their surprise, when darkness had fallen, the patrol heard the sound of digging close by, then movement behind them. Giles came to the conclusion that he was being surrounded, so collected his men together, ordered ‘fix bayonets’, and charged. After a number of Japs had been killed the patrol was able to extricate itself and streamed back into the perimeter. This was the first contact with the enemy at Kohima. It lasted till just before midnight, when the Japanese attacked the lower slopes of the Aradura Spur, where an ambush had been prepared by a platoon of the State troops. Unfortunately, the latter weren’t equal to the occasion and, after a bout of wild firing in all directions, they broke and ran. Some went right through the G.P.T. Ridge and Jail Hill positions, and a few kept going till Dimapur. Richards tried to stop the wild firing, knowing its effect on morale, but as soon as one sector had been dealt with, the jitters spread to another. Earlier on the 4th, Stopford had flown to Dimapur for a conference with Grover and Ranking. On arrival, he found a ‘very optimistic atmosphere’, as reports from various sources indicated ‘that 31st Jap Div. is of poor quality and demoralized’. Where these reports came from, it is now difficult to say, and all one can remark is that they were woefully inaccurate. However, it was at this meeting that Stopford came to an important decision, as he recorded: ‘Everything indicates that no attack is now likely to develop in the Manipur Road base [i.e. Dimapur] and that we should withdraw troops from there in order to strengthen the garrison at Kohima…. Told Ranking to send forward one battalion Of 161 Inf. Bde. to Kohima as quickly as possible.’ In fact, after further discussion, it was decided to despatch the whole Brigade. This decision, a reversal of the one given a few days previously, was undoubtedly right; but unhappily it came twenty-four hours too late. While Stopford was holding his conference, another important event was happening at Imphal: 4th Corps completed its withdrawal to the plain. The 17th, 20th, and 23rd Indian Divisions were now on their chosen ground, though encircled by the Japanese 15th and 33rd Divisions, and the I.N.A. forces. The 17th Division, which had already sustained heavy casualties was tired, but the 20th and 23rd Divisions had experienced an easier passage. All were now prepared for the onslaught to come. But as Scoones and his men all realized, the outcome of the battle depended not only on their own skill and gallantry, but on the success of the airlift and the length of time it could be maintained. They knew also that their own fate was now inextricably linked to the fate of their comrades at Kohima.